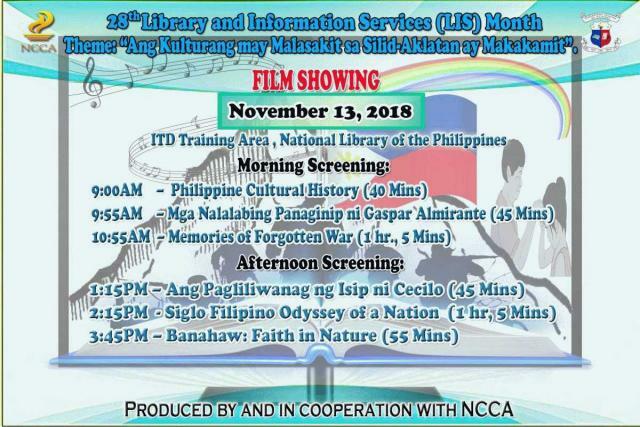 In line with the 2018 LIS Month celebration spearheaded by NCCA-NCLIS, NLP-ITD wishes to invite everyone to watch a film/documentary on November 13, 2018 (Tuesday) at ITD Training Area, 2nd Floor National Library of the Philippines, T.M. Kalaw St., Manila. 1. PHILIPPINE CULTURAL HISTORY - presents how philippine culture has evolved thousand years ago until recently. 2. MGA NALALABING PANAGINIP NI GASPAR ALMIRANTE - the rise and fall of Aurora Corporation, Philippine business legend. 3. MEMORIES OF FORGOTTEN WAR - wishes to create a history of the colonial rule as narrated by a filipina-american lady. 4. ANG PAGLILIWANAG NG ISIP NI CECILIO - deals with loyalty and love for country, self and others. 5. SIGLO FILIPINO ODYSSEY OF A NATION - tackles five chapters of a century of eventful journey of the filipinos. 6. BANAHAW: FAITH IN NATURE - belief in the divine power and nature by a group of locals in Quezon province. By knowing our culture and understanding our past, we can best define our future. Please take time to come to NLP and watch your preferred short film/documentary from the list and schedule given. Thank you and we hope to see you!